Discover how you too can build your own high quality murphy wall bed in as little as 3 days. You don’t need expert woodworking skills or fancy tools. Join the thousands of satisfied “do-it-yourselfers” who have built their own Murphy wall bed and saved thousands! Why do you need a Murphy bed? Download our “Step-by -Step Construction Guide” before you buy and see for yourself! Just fill out your first name and your best email to download an actual copy of our the construction guide in PDF format. You will be able to see all the steps involved in building your own DIY Murphy bed. Know for sure if this is a project you are willing to tackle before your purchase any of our fine hardware kits. 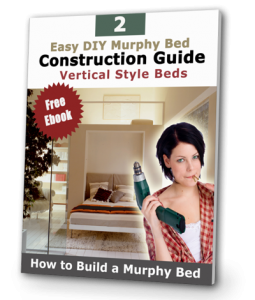 This is an actual copy of the construction guide that comes included with all our DIY Murphy bed kits. What is a DIY Murphy bed hardware kit? A “Do-It-Yourself” Murphy bed kit is a combination of mechanical hardware parts as well as all the necessary fasteners such as screws, bolts and connectors allowing you to build and assemble your own professional grade wall bed. The hardware parts are made using the finest manufacturing processes for years of trouble free operation. The included hardware is also powder coated guaranteeing your wall bed will look it best as long as you own it. 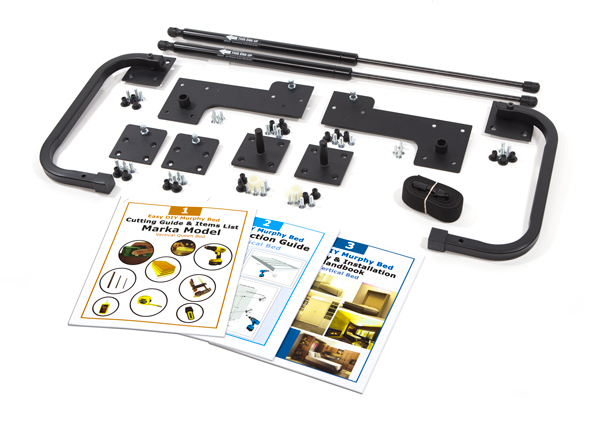 Our “Do It Yourself” Murphy Bed Hardware Kit is the is the finest DIY Murphy bed kit in the industry that includes high quality counter balanced spring mechanism manufactured in USA. All the other main metal components are made and manufactured in Canada. Our high-quality hardware kits also carry a full lifetime warranty so you have complete peace of mind. Some people believe that they must be a carpenter to build a Murphy bed …this isn’t true: anybody with basic woodworking skills can build a Murphy bed using our hardware. There are a vast range of customization options when you use one of our hardware kits that will it to fit into any style room or decor. A Murphy bed allows you to optimize your space anywhere in your house to create more room for your guests, your work, and what you love to do every day. What is included in an Easy DIY Murphy Bed Hardware kit? Our hardware kits include all the parts and hardware you will require to build a fully functional professional grade wall bed. 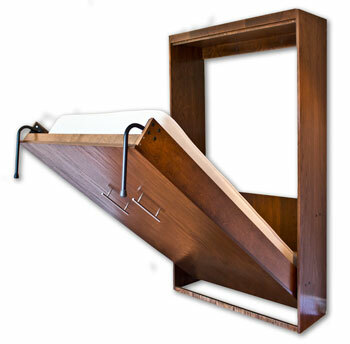 Included are a pair of easy-lift pistons, a pair of pivot plates, 2 lower mounting plates, 2 upper pistons stud plates, a pair of easy fold-up legs, an adjustable mattress strap, a box of all hardware screws, connectors and bolts you will require to attach the hardware components to the wooden bed parts. 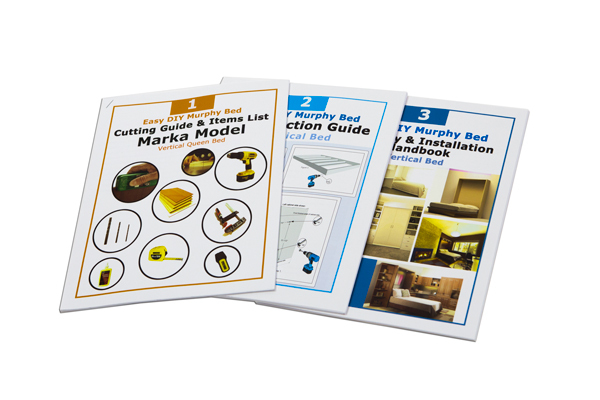 You also receive a set of 3 detailed step by step construction, assembly and lumber cutting guides as well as a DVD video showing the construction and assembly process. Complete set of 3 books, Construction, Assembly and Cutting Guide. A DVD is also included. 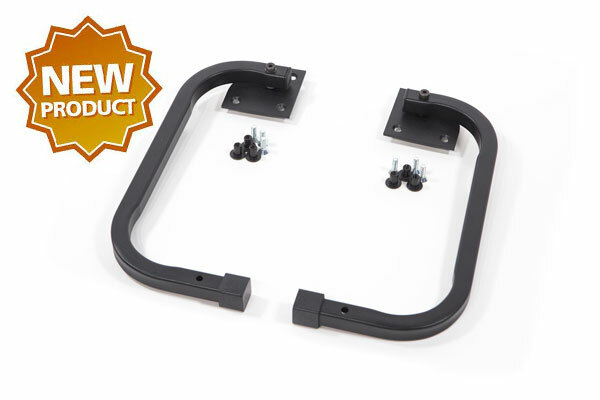 A pair of Made in USA, easy lift pistons that will make your wall bed a breeze to open and close. A pair of our unique design lower plates that are super easy to install and feature pivot and stud in one. 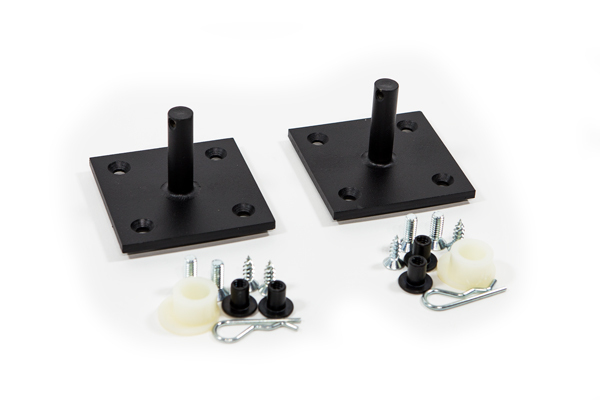 A pair of male pivot plates that work together with the easy lift system. A pair of upper stud plates that connect to the easy lift pistons. A pair of high quality fold-up legs that support the bed frame when it is in the open position. 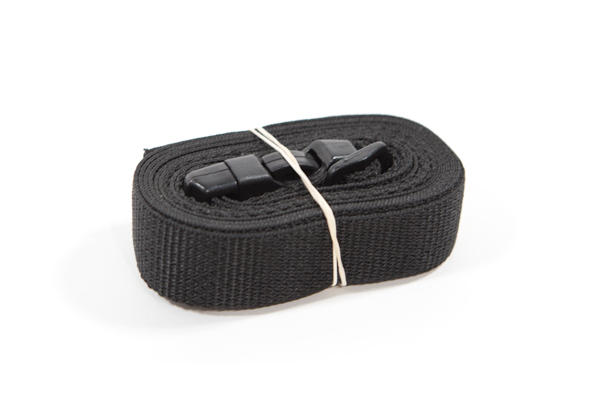 A fully adjustable buckle style mattress strap to hold your mattress down on the bed frame. Mike, this was one project that I really enjoyed and was given the freedom to start and actually finish the project without having 3 more to start!! Your project’s instructions were by far the very best that I have used to put anything together. Hi Nadia, Just wanted to say thank you very much for your assistance with this project. It turned out great. With your support and excellent product/comprehensive step by step instructions, I came up with an excellent space saving product. I look forward to doing it again. The Murphy bed project was easy and fun to do. My wife and I did it together at our cottage over the weekend and the instructions were easy to follow. Any issues we had we were able to call the 1-800 number and received quick and simple instructions and hints that made the process a snap!" How good is the Easy DIY Murphy bed hardware package? If you have seen Murphy beds, you will love our product! We have perfected William Murphy’s idea with contemporary design that can be customized and quality parts to make it safe and easy to build and use use for many years to come. 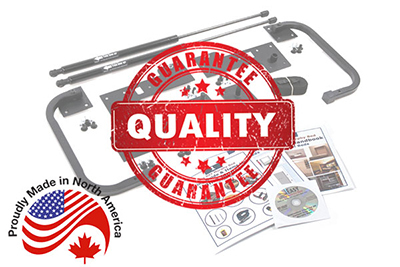 Our hardware kits are manufactured in Canada with North American sourced materials and parts. We do not use foreign parts that are often of lower quality and durability. Besides you have our lifetime warranty to lean on in case there is a problem with your Murphy bed hardware. You get Lifetime Warranty for complete peace of mind! 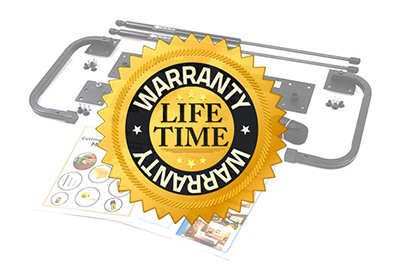 We are so confident about the quality of our Murphy bed hardware kits that we give you a full lifetime warranty on all hardware parts included in any of our do-it-yourself kits. You have complete peace of mind when you purchase one of our kits. We will replace and of the hardware parts included on our kits free of charge for as long as you own your DIY Murphy bed. We even cover the shipping charges for free for any warranty parts anywhere in the USA and Canada.